Get your Dandiya sticks, ladies! 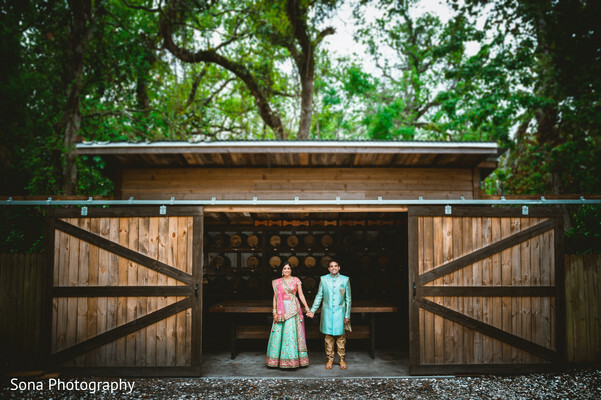 Sejal and Vinit’s marriage was preceded by a vibrant Sangeet night at the Omni Amelia Island Plantation as part of their big Indian wedding festivity. The venue gathered both bride and groom’s complete clan under one roof to enjoy a series of performances by the specialized Rawal Brothers Band! 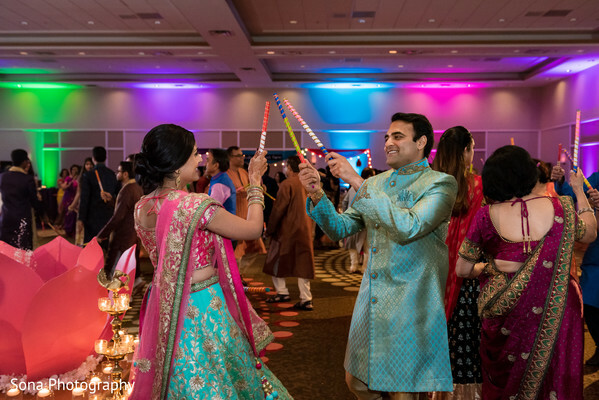 No Sangeet night can be complete without some enthusiastic Gaarba choreographies along with colorful dandiya sticks that the bride and groom used to pick up the right steps! A magnificent stage was built by the creative team of Nikun Events and the bold turquoise and pink draped backdrop complemented the lush scenario! 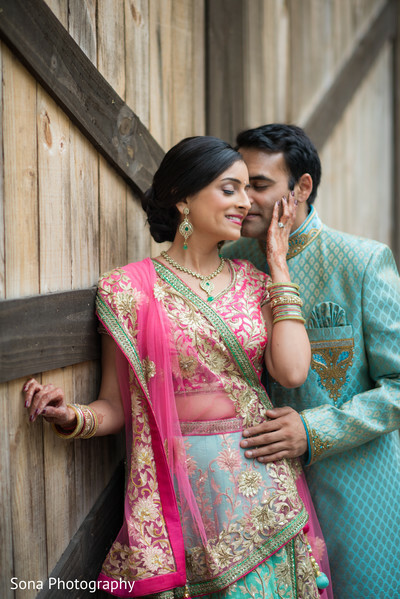 Sejal wore a stunning turquoise and pink lehenga that she styled with a matching jewelry set that corresponded with Vinit’s wear, what a fantastic way to add a memorable charm to the celebration! The amazing images and portraits of the joyful celebrations were all captured by Sona Photography, the precious moments are all in our full gallery to give you a rush of inspiration for your own pre-wedding night! We initially got in touch after being matched on Hinge. After a month or so of texting, we had our first date at Gottino, a bar in the West Village in New York. Our relationship took off pretty quickly from there. About four months into us dating, Vinit was looking to move to a new apartment. He was looking at all the buildings in my area, except for my building. I suggested he look in my building and he found a great apartment. He took the apartment and moved in a month later. That was the start of knowing he was the one! I really knew, though, after he spent a weekend in Fire Island with ~15 of my college friends. Two guys got into a food fight and an entire birthday cake ended up on Vinit’s lap. His clothes were ruined. But he just laughed it off, changed, and continued having a great time. Seeing how easily he mixed with all my friends, while still looking out for me, and how much more I enjoyed any experience when he was around made me realize he was the one. Six months into us dating we took a trip to Italy together. It was there that we first talked about how we thought we would get married and knew we both had found the one. We got engaged on June 10th, 2016. About a month before this, Vinit’s sister-in-law emailed both of us saying they had won tickets in an auction to the Broadway show “The Color Purple” for June 10th and wanted to see if we wanted to go with them. We of course agreed, and I didn’t think twice about it! A couple days before, Vinit’s brother suggested we go to dinner beforehand and told us a time and restaurant to meet at. Since Vinit and I lived in the same building, on the day of, he told me to just come over to his place and we’d head out together. As I opened his door I just saw candles and rose petals everywhere. He lined the path from the doorway to the center of the living room with candles, flowers, and rose petals, and he stood waiting in a suit. He said many nice things (which I had to be retold later) and then got down on one knee. After the proposal, I turned around to see that on his dining table he had printed tons of pictures of us and also had mementos from our dates – like the scorecard from going mini-golfing on our third date, and the card of the restaurant we went to in Jacksonville on our first Valentine’s day. He had also made a beautiful playlist of all my favorite romantic songs. After we spent some time together, I asked if I could call my parents. He said, why don’t we go tell your sister first (whom I lived with just upstairs). When we went up to the apartment, I was surprised by my parents, his parents, my sister, and his brother and his family. We popped champagne and spent time together before going to an amazing dinner at ABC Kitchen that Vinit had organized. Then we got to spend the rest of the weekend as a soon to be family! Wedding planning was not easy as I lived in California, Vinit was in New York, and the wedding was going to be in Florida. However, we had tremendous help from our parents and siblings to make it all happen. 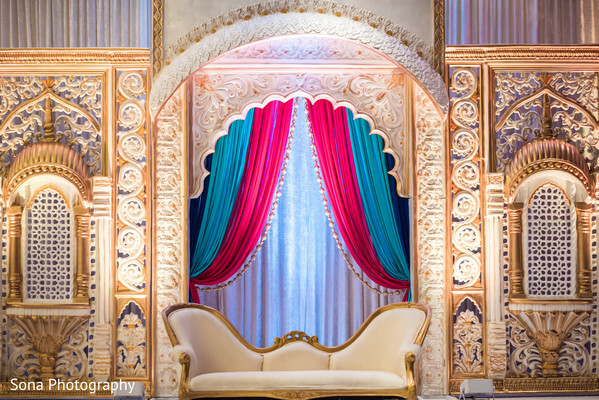 The Omni Amelia Island Plantation, where we held the wedding, was phenomenal in adapting to the needs of an Indian wedding. 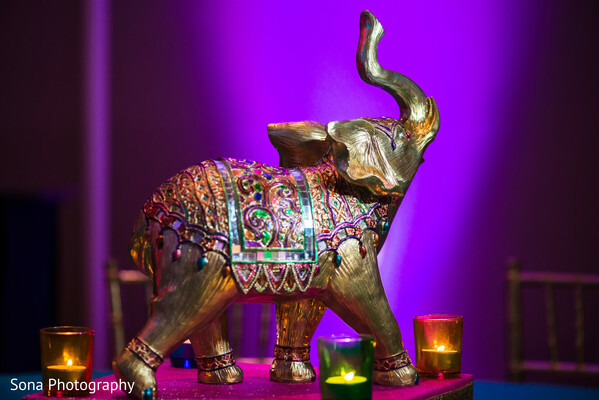 We had great experiences with many vendors, including Sona Photography, Riant Films, Beyond a Salon, DJ Shilpa, Signature Weddings & Events (Cyndi Benzel), and many more. We were fortunate that because I had grown up in a vibrant Indian community in Jacksonville, we had recommendations from numerous family friends and had experience working with many of the vendors in the past. Our families went shopping in Mumbai to pick out wedding clothes. I had been following all the major designers on Instagram for a long time by this point so had an idea of the styles. I knew for the wedding itself I would have a red lengha or red and white. We found a phenomenal selection at Friendship in Mumbai as well as at Seasons and all the clothes for myself, my sister, and my mom were bought from these stores. Spreadsheets! But really. I love organizing and making to-do lists, almost to a fault. And I love making Excel spreadsheets! I genuinely enjoy executing on tasks and thinking of next steps, so enjoyed, or rather felt competent at, that aspect of the planning process. The food and the music! The food was incredibly good, with so much variety and quantity. Rajbhog did a phenomenal job. DJ Shilpa kept the party going all day and all night. 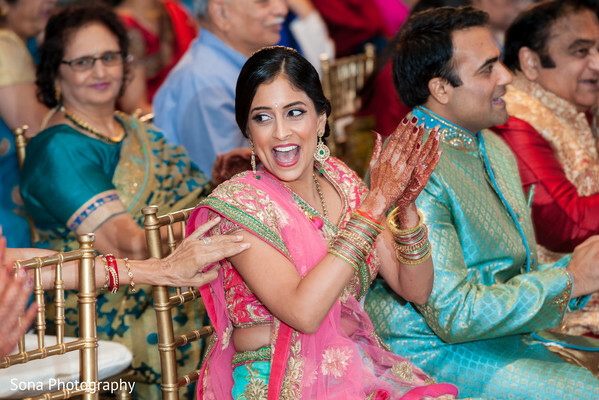 She, her team, and the dhol player made the Baraat one of the liveliest that people have ever been to and made sure the garba and the reception had everyone on the dance floor. 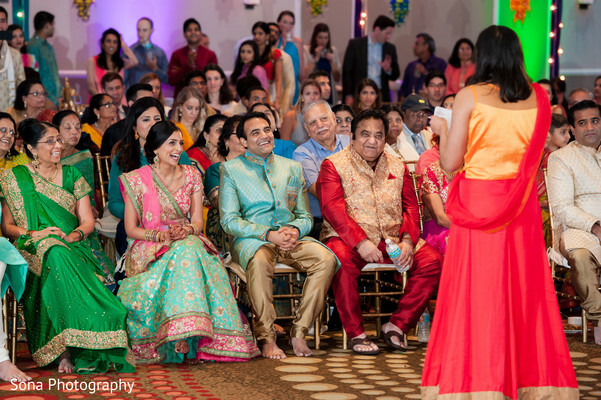 We also received many compliments on how all of the events started on time…perhaps a pleasant surprise for an Indian wedding! Finally, we got a lot of compliments on our ceremony and how we had adapted the traditional Hindu / Jain ceremony to be our own. Honestly, everything about it was perfect. Two moments do come to mind though. One is being on the mandap. Vinit and I would chat up there, making each other laugh here and there. It really felt like we were just hanging out. But then we would look out at the audience and see all the people we love and care about, through so many walks of life, smiling back at us. To have everyone that is important to you in one place at one time is so special. I felt similarly when we were on the dance floor at the reception. Just looking around the dance circles and seeing everyone having a blast, and being there for you, is overwhelming in the most positive way. Though I knew this, I was reminded a million times over, how strong the Indian community in Jacksonville is and how lucky I am to have grown up there. Our family’s closest friends were constantly helping with all the details. I spent the two weeks before the wedding at home and was amazed by the number of people always showing up to help. The uncles and aunties transformed our house, decorating it with colorful saris and lights throughout our home, and helping to organize and decorate a tent in our backyard. They were always the first to show up and the last to leave. Some of the aunties even prepared special songs to sing at the mehndi and pithi. The biggest surprise of all was that seven couples and my parents performed a dance at the Garba. My parents rarely dance, but it was their idea, and the family friends agreed without hesitation. It was incredibly special. It was also so special to have our friends dance at both the Garba and the reception. 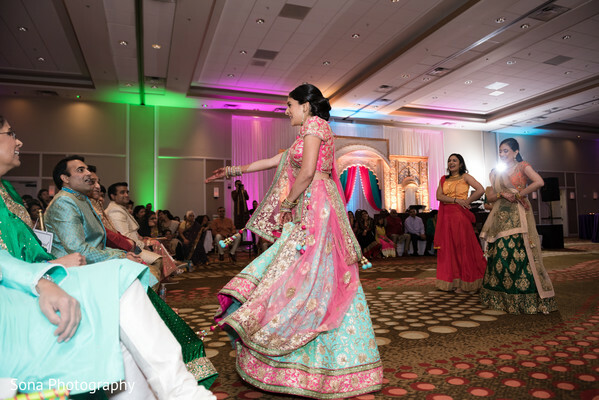 My bridesmaids from Jacksonville performed a dance at the Garba, which I joined as a surprise. Then our friends from childhood, college, grad school, and NY performed a dance at the reception. They started off re-creating dances I had choreographed for other friends’ weddings which were so creative, thoughtful, and fun, and ended with a dance of their own. One of the most fun parts for Vinit and I, even before the actual day, was learning our first dance. My family had gifted us dance lessons in which a very strict teacher got us prepped for our debut performance. We had a great time learning and practicing and then finally getting to perform it. My dad and I surprised the crowd during our Father / Daughter dance by transitioning from a slow song into a Bollywood dance. It was actually his idea to do this, and we had a great time with it! Our ceremony was also really special as we made many parts our own. Our priest is someone very special to me as I’ve grown up with him as the leader of our mandhir. He worked with us to make sure it was exactly what we wanted, and did a tremendous job translating each and every detail in English so that the entire audience could understand what was happening throughout the ceremony. We made the decision to remove the Kanyadaan as I felt it did not align with the values we hold for a women’s role in marriage and life. We replaced it with a step we created in which both of our families came to the mandap and we expressed our promises and commitments to them as our families came together. It was very special for us to do this and something that our guests very much enjoyed as well. We got a lot of positive feedback that there are rituals that can be seen as outdated, and it was great to see how we can evolve our customs to better represent how we think and live today. Vinit and I aren’t the most creative people so our décor was mainly a mix of things we had seen in pictures and inspiration from our decorators. Our decorators did a fantastic job of a quick switch to an indoor ceremony when it turned out to be too windy to host it on the beach. And finally, most importantly, keep open communication with your partner. Keep in mind that what you are doing is just planning an event, but you have the rest of your life ahead. Don’t let the magic of your relationship die with the stress of planning. Publix makes the most incredible wedding cakes. We have gotten so many compliments on the cake and people cannot believe it is from a grocery store (even if it is the best grocery store!). The Omni in Amelia Island is a fantastic venue to consider for anyone in Florida or anyone looking for a destination wedding. The property is absolutely beautiful with an array of activities for your guests. 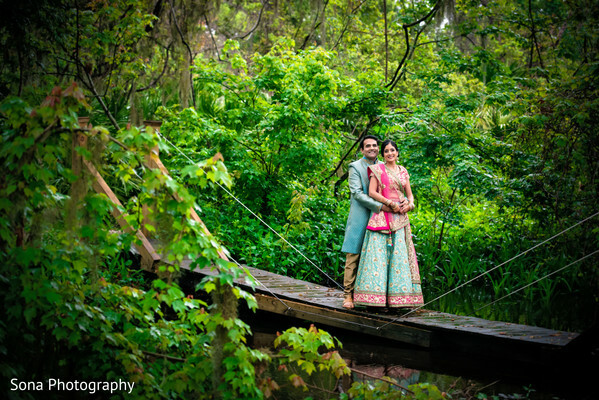 While still new to Indian weddings, the sales manager and events coordinator worked extremely hard to accommodate our requests and help ensure we had an amazing wedding weekend. Sushila from Sushila’s Beauty Care in Jacksonville provides fantastic mehndi along with several other services like hair, makeup, sari dressing, etc. Chapter two is right around the corner! Shilpa Entertainment, Nikun Events and Sona Photography are members of the Platinum Guide. Love what you see? Explore their portfolios.